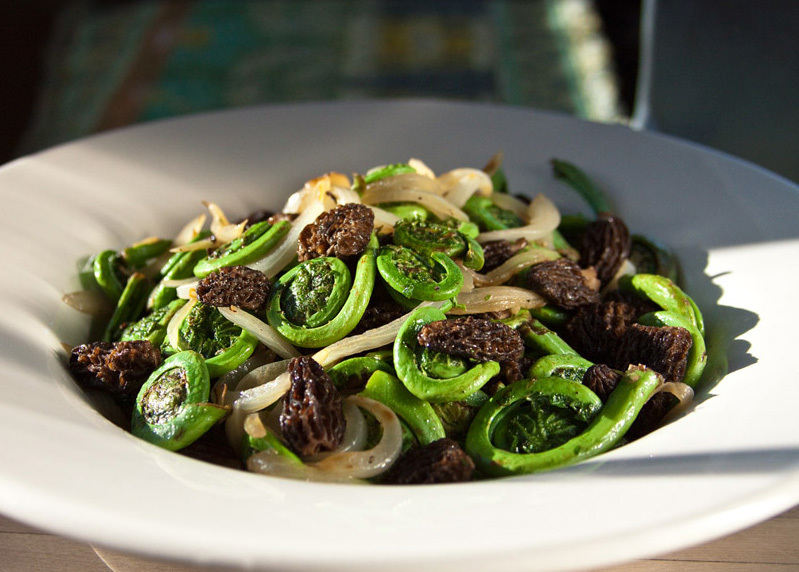 Fiddleheads and morel mushrooms – a pairing that captures the essence of spring. You can substitute fresh morels for the dried morels used in this recipe, but frankly, I prefer the deep, smoky flavor that dried morels impart. Choose the tiniest dried morels available so they can be used whole. They look great, but taste even better. Rinse the fiddleheads in cold water and drain. Trim the tips of the stem if desired. Soak the dried morels in warm water for 30 minutes or until soft and pliable. Drain, reserving the soaking liquid for other uses if desired. Rinse the morels gently, but thoroughly under cool running water to remove any remaining grit or forest debris. Bring a large pot of salted water to a boil. Blanch the fiddleheads in the boiling water for about two minutes, just long enough to allow the water to come back to a gentle boil. 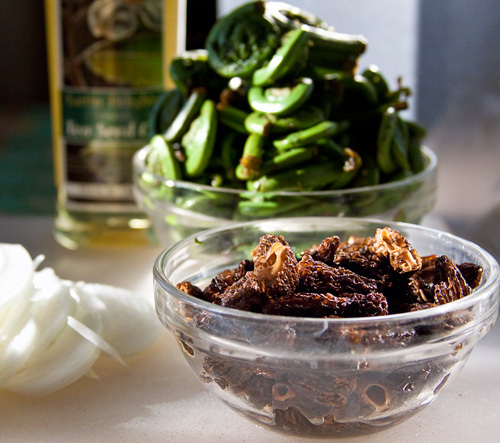 Drain the fiddleheads and “shock” them by plunging them into a large bowl of very cold water. This will halt the cooking process and prevent the fiddleheads from overcooking. Peel the onion and slice it lengthwise into thin strips, 1/4-inch or less in width. Set aside. Heat a wok or large skillet over high heat until it begins to smoke. Add the oil and swirl it around to coat the pan. Add the onion strips and cook, stirring, until they begin to soften slightly, about 1 minute. Remove the onions from the pan and set aside. Add the reconstituted morels to the pan. There should still be enough oil coating the pan to brown them. Cook them for about 2 minutes, stirring frequently. Add 1 cup of water and simmer the morels until the water is completely evaporated, about 5 minutes. Remove them from the pan and set aside. Wipe the pan clean and return it to medium-high heat. Add the butter. 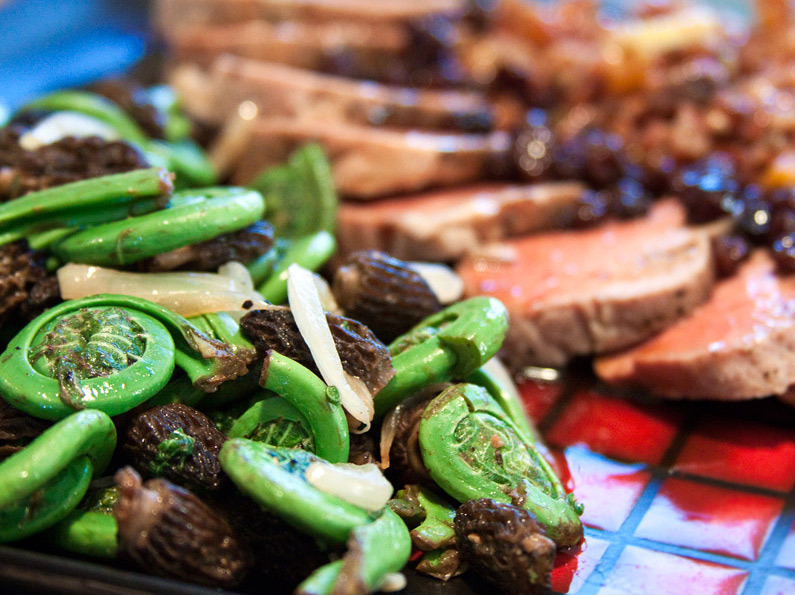 When it has completely melted and begins to brown and foam, add the blanched fiddleheads. Cook them in the butter, tossing them frequently, until they begin to brown slightly, about 2 minutes. Add the cooked morels and onions, then season with salt and pepper. Toss again and cook just until all ingredients are hot, about 1 minute. So where in the San Francisco Bay area might I find FRESH fiddleheads??? You’ve got me wonderfully obsessed with the idea.